Carman J. Overholt, Q.C., established Overholt Law on June 18, 2012 after practicing with large law firms in downtown Vancouver for 26 years. Overholt Law is an employment and labour relations boutique law firm located in the heart of the downtown Vancouver business community where Carman has practiced since his Call to the Bar on August 1, 1986. 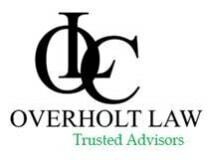 Overholt Law is the trusted advisor for businesses, organizations, government agencies and individuals who require legal advice and representation in the resolution of employment, labour relations and commercial disputes. As a senior litigation lawyer, Carman has advised clients throughout his career on complex employment and commercial disputes. In the course of his career, Carman has appeared before all levels of the Courts in the Province of British Columbia and all the administrative tribunals with jurisdiction over the workplace. Carman has successfully defended many applications for leave to appeal to the Supreme Court of Canada. As litigation counsel, Carman has appeared as counsel in many noteworthy and reported proceedings before the Supreme Court of BC and BC Court of Appeal. As counsel for Echo Bay Mines Ltd., Carman successfully defended an employment class action commenced in the Supreme Court of British Columbia by approximately 400 employees. Carman was also counsel for Echo Bay Mines Ltd. in the subsequent appeal to the BC Court of Appeal and the application for leave to appeal to the Supreme Court of Canada. Carman has extensive experience in the negotiation of complex multi-party settlements and the mediation of disputes. Carman has conducted collective bargaining and advised employers on compliance with all the legislation that regulates the workplace. His experience includes advising employers in connection with strikes and lockouts. In his labour relations practice, Carman has appeared as counsel for employers in numerous labour arbitrations and has advised on a wide range of workplace disputes. Carman's practice experience includes advising Vendors and Purchasers on the wide range of employment, labour relations, human rights and privacy issues raised by the purchase and sale of a business. The Supreme Court of Canada has recognized the fundamental importance of employment to Canadian Society. As such, Carman advises individuals in connection with their contractual rights and obligations to employers. Carman's experience includes many good negotiated settlements and successes obtained in mediation and in the Courts.